While numerous tech and automobile giants are currently building out their autonomous self-driving vehicles, some are just focusing their resources on platforms to back this growing category. Today, Samsung is also joining the autonomous ecosystem and shown off its DRVLINE platform in line with the trend at CES 2018. As described in Samsung’s official blog post, DRVLINE is a first-of-its-kind open, modular and scalable platform that will enable automakers to integrate connected technology into their vehicles. 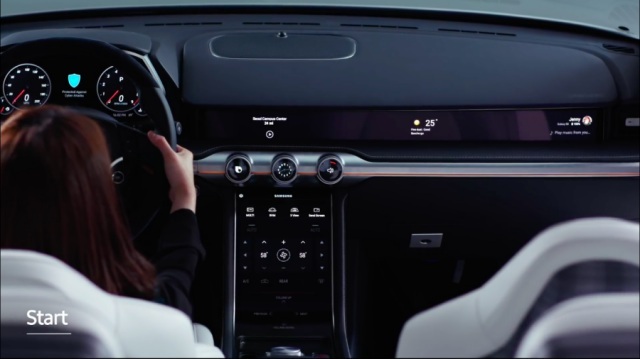 It collates the company’s top technologies and components to make an in-car intelligence platform, which features lane departure warning, forward collision warning, pedestrian detection, and automatic emergency braking. The Korean giant is adopting this strategy to collaborate with industry specialists to further advance its autonomous platform. It also makes the DRVLINE platform customizable to the needs of any automaker, who can then focus on making their vehicles for Level 5 autonomy. The varied capabilities of Samsung’s DRVLINE platform will come in quite handy as it will transform how we interact and drive around in our vehicles. Samsung has further highlighted that its $8 million acquisition of Harman plays a vital role in the development of the platform. It’s now collaborating with the team over at Harman to build a new digital cockpit, which is chock-full of digital dials, touchscreens, and Samsung’s in-house AI assistant – Bixby. The concept does look aesthetically pleasing and useful from the looks of it, but we’ll have to wait for a real-life implementation to fully realize its potential.